In the philosophy of taoism, the yin and yang represent the balance of opposites in the universe. Each of these opposites produce the other. Molding the yin and the yang dough into a spoon. “In yin and yang neither is positive or negative but neither can exist without the other,” said Steve, succinctly touching on some of the basic tenets of this ancient Chinese philosophy. “These cookies are two sides of a coin–like me and Steve,” added Annamarie Asher, his mother. “No matter what tension is in our lives, baking can make it better,” she said. Annamarie is the baker, Steve is the appreciator. The cookies were Steve’s idea and his mom hit the perfect balance in their Yin Yang Cookie. Did I mention they are delicious? My daughter, a cookie connoisseur, pronounced them “chunkoliciously exceptional”, washing the entire plate of cookies down with a glass of milk. They are actually two cookie recipes rolled into one. The chocolate cookie recipe was found on the package of Reese’s peanut butter chips and the peanut butter cookie was found on Allrecipes.com, a recipe submitted by Kevin Ryan. 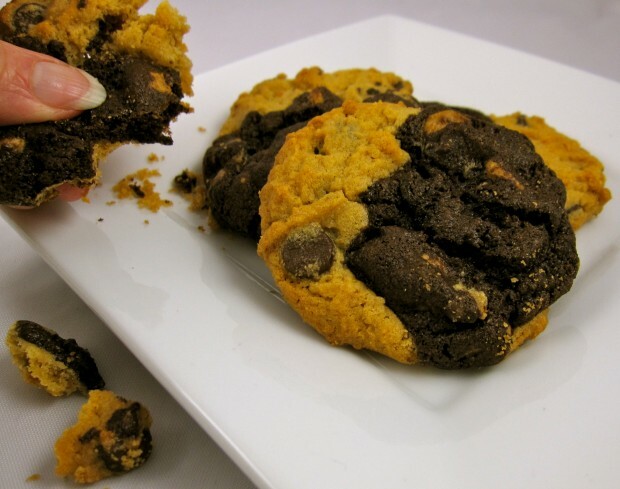 Both have been modified by Annamarie to make the perfect Yin-Yang cookie–two different, yet complementary, cookies molded into one unique, crumbly creation. I met Annamarie while taking a walk with my husband last summer. It was at that time I had the opportunity to sample her “Lusciously Lemony Wedding Cake” and discovered our sons were classmates at Community High. Neither of us can recall a cookie exchange while our kids were in school, but we’re confident these cookies would have been most popular. Love, emotion and imagination are three additional ingredients baked into these cookies! For the Chewy Chocolate Cookies: Stir together flour, cocoa, baking soda and salt. In large bowl, beat butter and sugar with electric mixer until light and fluffy. Add eggs and vanilla; beat well. Gradually add flour mixture, beating well. Stir in peanut butter chips. Form logs and chill 2 hours, and up to 24 hours. This is a stiff dough and the logs make it easier to break or cut into small cookie pieces. For the Peanut Butter Cookies: In a large bowl, cream butter, white sugar, and brown sugar until smooth. Add the eggs, yolks and vanilla; mix until fluffy. Stir in peanut butter. Sift together the flour, baking soda and salt; stir into the peanut butter mixture. This dough is not as stiff as the chocolate dough and should be refrigerated in a bowl at least 2 hours and up to 24 hours. 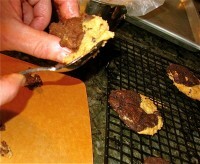 To make the yin-yang cookies: Take a small “blob” of the chocolate cookie dough, slightly less than 1 tablespoon. Hold this in your fingers, not on a spoon. Take a similar amount of peanut butter dough on a spoon and smear it on one side and under the chocolate dough “blob” you are holding. Place each dough combination on an ungreased cookie sheet. Bake no more than 15 minutes; begin checking them after 10 minutes. They should be puffed and just beginning to firm up a bit; they will darken as they cool. Cool on cooking sheet about 5 minutes. Remove from cookie sheet to wire rack. Cool completely. When storing these cookies, do not stack them too high or place them in a cookie jar as they may crumble. 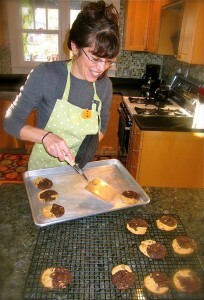 The “smearing” technique is to ensure you mold the peanut butter dough under the chocolate dough so the cookies stay in one piece. More Recipes Filed Under "Cookies"